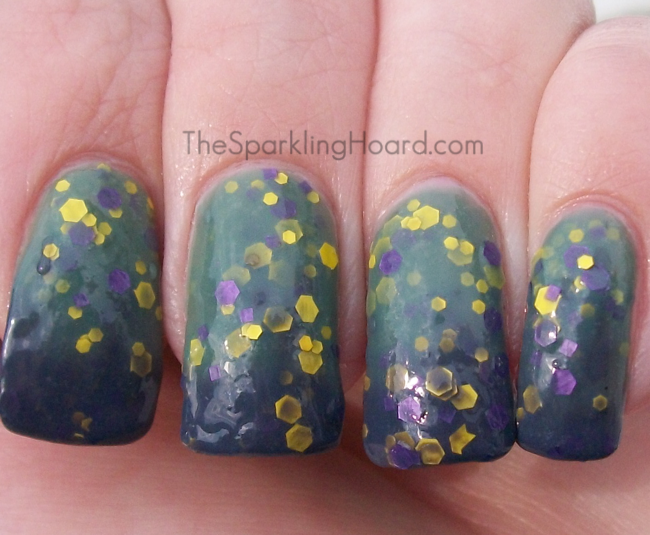 The Sparkling Hoard: Pretty & Polished: I'm Wonka for Willy! I keep waiting for my neighbors to ask me what in the world I'm doing when I'm outside taking photos of my hand. So far, they haven't questioned it. I thought that surely they would have questioned me while I was taking these photos, since I kept dunking my hand into cups of water before taking the pictures, but nope! Why was I dunking my hand into cups of water? 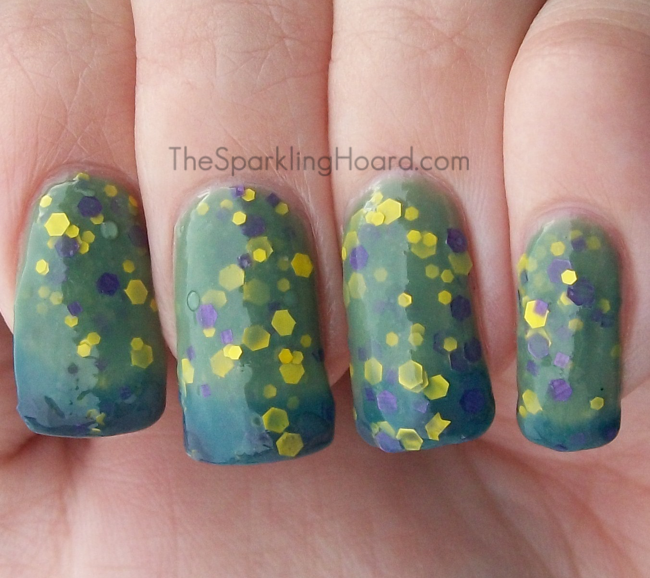 Because I was swatching one of Pretty and Polished's color-changing lacquers, of course! These polishes are sensitive to temperature changes, and the best way to see the color change is by sticking your hand under warm water and cold water. SO FUN! 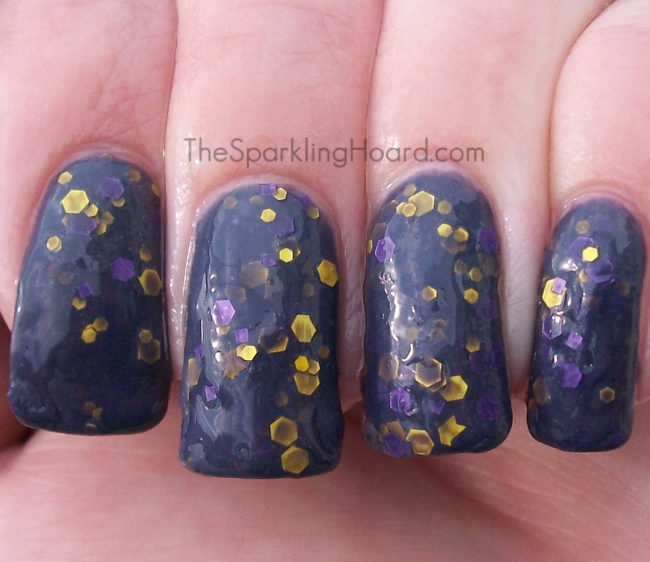 I'm Wonka For Willy features 2 sizes of yellow hex glitter, purple hex glitter, and purple square glitter in a creamy base. When the polish is cool, the base is a deep purple. When the polish is warm, the base is a sort of dusty light green. If you have longer nails, like I do, you will likely experience both colors at once, with your nail bed area being green and the tips being purple! The color changes quickly and easily, and it's quite fun to watch! The formula on this was great. It was so easy to control that I didn't have to do any clean up! Dry time was fast. A thick coat of a fast-drying top coat takes care of most of the bumpiness. Nail bed area is warming up! This is what it looked like most of the time! Warm nail bed area, cool tips. I love when I get to review a unique and well-made product, and I'm Wonka for Willy definitely fits that description! I have to say, though, I don't really get Willy Wonka vibes from this...it reminds me more of fun stuff from my childhood, like Goosebumps books, Nickelodeon, and Gak...which is just as good! 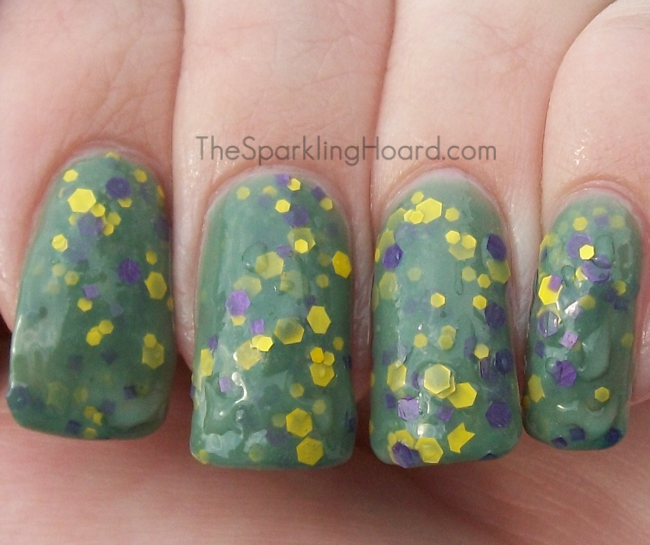 I'm Wonka for Willy will be available at Pretty & Polished's online store starting July 2nd. Color-changing polishes cost $9.00 for 15mL. While you're waiting for I'm Wonka for Willy to be released, you might want to give some thought to buying some of Pretty & Polished's previous releases! Many of them, including some color-changing polishes, are on sale! P&P is moving to a new location and they don't want to have to move tons of bottles of polish in the process, so they're hoping to sell off as much of their old stock as possible! For the latest Pretty & Polished news, Like their Facebook page and follow them on Twitter and Instagram! Whaaaaat. This is a great combination of colors. It's so.....funky! lol, in a good way! I don't think I have anything else like it! I love Pretty & Polished! I actually just removed 'Day Trippin' a couple hours ago. 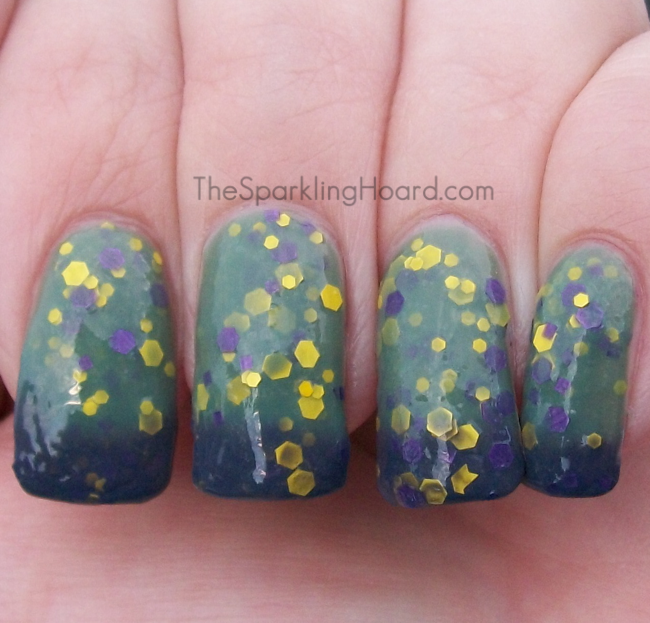 I had paired it up with Dollish Polish's 'This Pop Rocks! ', and it was a gorgeous combo. I got so many compliments on my nails, that I actually left it on for a whole week! I'm not sure how I feel about it with the glitter right in the polish though... It really makes it looks thick and uneven. I love the colors though.